The Detroit Red Wings won the 2008 Stanley Cup. The San Jose Sharks had to settle for having the year's best won-lost record. Despite a 3-2 overtime loss at Minnesota on New Year's Eve, the Sharks finished calendar year 2008 with the NHL's best record, going 55-15-10 in their 80 games, a .688 winning percentage and a .750 percentage of available points (120 of 160). They were especially good after Feb. 21; their win over the Philadelphia Flyers that night began a stretch in which San Jose went 48-6-7 through the end of the year. The Sharks' 120 points topped Boston (112) and Washington (110). The Sharks were especially good at home; they finished the year 34-3-5 at HP Pavilion and were 26-0-3 in their last 29 games at the Shark Tank. They are fourth on the all-time list for longest streak without a regulation loss at home. On the other end of the spectrum were the New York Islanders, who despite Wednesday's 4-2 victory over the Florida Panthers were a League-worst 27-44-11 in 2008. Perhaps the lone positive for the Isles was that Joey MacDonald was the winning goaltender against the Panthers, enabling him to avoid becoming the first goaltender since Detroit's Jim Rutherford in March 1977 to have more than 10 decisions in a month and not win any of them. Rutherford was 0-13-1; MacDonald was 1-10-2 before Wednesday's win. One reason the Islanders have struggled so badly is their inability to keep the puck out of their own net. The Isles allowed five or more goals seven times in all of 2007-08; they've already surrendered five or more 11 times in only 38 games this season. In contrast, they've scored as many as five goals just once this season. 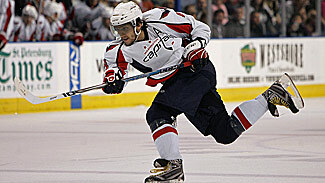 Hot sticks — Alex Ovechkin is the reigning Art Ross Trophy winner as the NHL scoring champion. But 2007-08 runner-up Evgeni Malkin had the most points in calendar year 2008. The 22-year-old, who leads the NHL with 59 points this season, had 124 points in the just-concluded year, while Ovechkin was second with 112. Wish for '09 — On the Vancouver Canucks' list of New Year's resolutions: Beat the Philadelphia Flyers if they come to GM Place this year. The Flyers ended 2008 with a 3-2 victory in Vancouver, extending their unbeaten streak there to 14 games (10-0 with 4 ties), the longest current road winning streak by one team in a single city. Vancouver hasn't beaten the Flyers at home since Jan. 17, 1989, and has never beaten them in their current home — the Flyers improved to 7-0-1 lifetime at GM Place. One-upping Dad — Bob Nystrom had his number retired by the New York Islanders, for whom he played 900 games and scored 235 goals. His son Eric is nowhere near the scorer that Dad was — he has only 2 goals this season and 5 for his career — but Eric does own one accomplishment his father never managed: scoring a goal with his team playing down a man. Eric's shorthanded goal Monday night gave the Calgary Flames a 2-1 victory at Minnesota and was the first shorthanded goal by a member of the Nystrom family. Even-up — Nystrom's teammate Rene Bourque doesn't usually come to mind when the discussion turns to great goal scorers. But Bourque enters the new year with 14 goals, just two shy of his career best, after his first three-goal game in Saturday night's 6-3 win over Ottawa. His goal total is more impressive when you consider that he's the only player in the NHL who's in double figures in goals without scoring once on the power play. Bourque has one shorthanded goal and 13 at even strength. In contrast, Anaheim's Teemu Selanne — also a 14-goal scorer — has a League-leading 13 of them on the power play but has scored just once at even strength. Mr. Minus — Carolina forward Rod Brind'Amour had to be happy to see 2008 turn into 2009. Brind'Amour began last year as a plus player during his distinguished career, but ended it on the other side of the ledger. He entered the new year with a League-worst minus-26 rating, putting him at minus-13 for his career. Brind'Amour has never finished a season with a rating worse than minus-13, and hasn't been a minus player since 2002-03. One area in which Brind'Amour still excels is winning faceoffs. He enters the weekend with a 63.2 success rate (523 of 827), second only to Nashville's Radek Bonk, who was at 63.5 percent but had taken less than half as many draws (winning 235 of 370). Missing Mike — Like Brind'Amour, the Islanders' Mike Sillinger is one of the NHL's top faceoff men — and the Isles have been feeling his absence in the circle. In Sillinger's first two seasons on Long Island, the Isles won 51.6 percent and 51.0 percent of their faceoffs. But with Sillinger out for all but seven games this season while recovering from hip surgery and then nursing a groin pull, the Isles have been getting clobbered on draws. Through 38 games, they were next-to-last in the NHL with a 46.0 winning percentage. That figure would be even lower except for Sillinger's efforts in the seven games he's played — he's 71-for-122, or 58.3 percent.